Little Jessica, shivering and hungry, warms her feet at the coffee-peddler's stall. It is there that she receives stale bread and coffee from the greedy and selfish peddler. The day comes when Jessica says her very first prayer. Her childlike faith is a breath of fresh air. This tender story was a favorite for young people, and needs to find its way back to every child's bookcase today! From Sarah of Salisbury, North Carolina on 4/4/2016 . Another great story from Lamplighter Theatre! They can be trusted for classic, quality, audio drama. From Tracy of Boise, Idaho on 8/20/2015 . 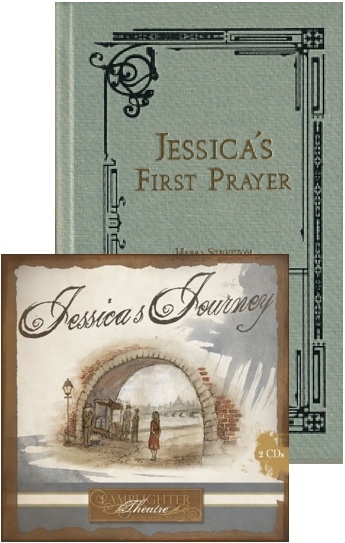 Jessica's [First Prayer] is our favorite Lamplighter book. As one of the few with a sequel, we absolutely loved the challenges presented to our faith in this little gem. However, my girls (6, 10 & 12) had a very difficult time listening to the small scene [in the Jessica's Journey audio] where the mother is drunkenly abusing her daughter. While the book is perfectly appropriate and inspiring for young children, caution should be exercised when sharing the audio drama with little ears.